In bowl mix together sausage, bread crumbs, 1 egg, thyme, parsley, onion powder, garlic powder, salt and pepper. Section off into 6 equal portions and set aside. On a floured surface unfold your pastry dough and gently roll out a little bit so it gets a little thinner then cut into 3 long rectangle sections. Bring sides together and pinch to seal and pat down slightly, repeat with remaining sausage and dough. Cut easy "log" 6 equal portions about 2" long and then pierce the top with a knife 2 times to create venting holes. 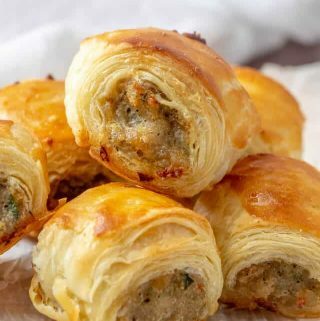 In a small bowl whisk together egg and water and then brush on tops of the sausage rolls and bake in oven for about 20 minutes until pastry is puffed and tops are golden.